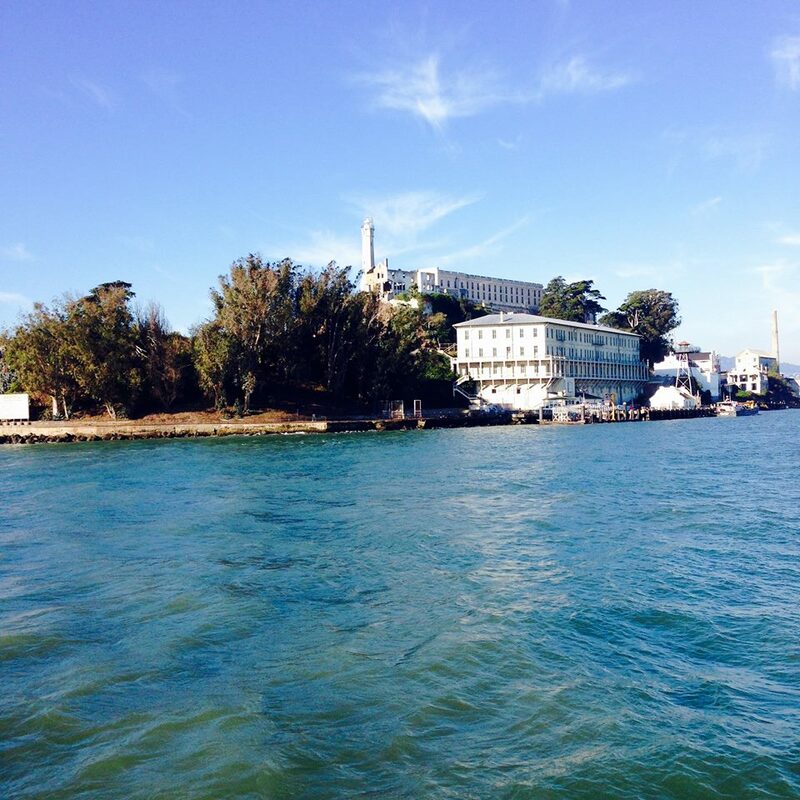 SAN FRANCISCO –– “Go ahead, swim!” yelled Commandant Col. G. Maury Cralle to scheming Alcatraz inmates when he received word of a rumored mass escape in 1926. Cralle’s sarcastic encouragement forced dire reality to hit desperate Alcatraz inmates considering escape: it would take a one and a half mile swim from Alcatraz to reach San Francisco’s mainland, but toss in the bay’s frigid, 58 degree Fahrenheit waters and six to eight miles per hour wind-driven currents, along with sharks, and the odds of a successful escape are slim to none. Alcatraz, a former U.S. prison and also known as “the Rock,” comes into view from the ferry in San Francisco (Photos by Roxana Maza). In the best-case scenario, in terms of survival, the inmates would be found and brought back to “the Rock,” as Alcatraz was otherwise known. In the worst-case scenario, inmates would be gunned down or they’d manage to disappear, only to reappear on the shores of the Rock many days later as drowning victims. Alcatraz Island is no longer a prison, of course, and is now one of several locations of the Golden Gate National Recreation Area in San Francisco and part of the National Park Service collection in Northern California. Besides the natural forces that swayed prisoners from attempting to escape, Alcatraz was notorious for being a maximum-security prison, possessing the resources to make it an elaborately complicated and isolated fortress to escape. Although Alcatraz was where troublesome, dangerous prisoners were taken, it had no gas chambers or execution facilities on the island. A shot of one of the C block prison cells. Many cells in Alcatraz are run down, broken or empty, and so some are recreated to look like how they might have if they were occupied today. While Alcatraz served as a prison for 29 years, 14 total escape attempts were made. Thirty-four prisoners tried to escape, and all but five were recaptured or otherwise accounted for. 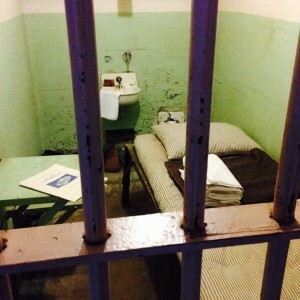 In Alcatraz, 1,545 total prisoners served their time there. Alcatraz was never filled to its capacity, and housed an average 260 inmates at any given time. 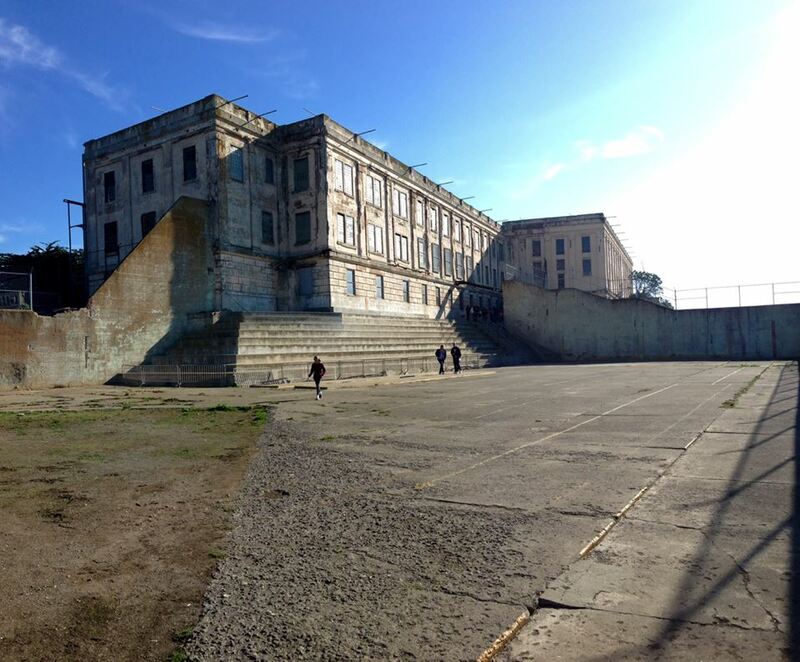 “Alcatraz opened as a federal penitentiary in 1934 and closed in 1963,” said Alcatraz Island Park Ranger Matt Murphy. Alcatraz is composed of four cell blocks. The A block was not used to house inmates during its prison years, while the B and C Blocks – which were a total 336 cells – were where the majority of inmates were held. 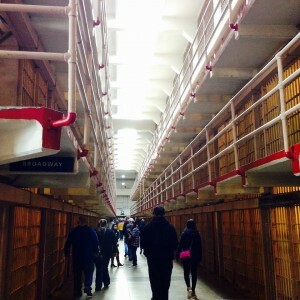 Alcatraz’s C Block, when combined with its B block, totaled 336 cells. The majority of inmates were held here. D Block, known as isolation and composed of 42 cells, was the segregated prison block where unruly and troublesome inmates were taken. According to the audio guide provided while touring Alcatraz, notorious criminals, Al “Scarface” Capone and Robert “Birdman” Stroud spent time in D Block. Other notorious Alcatraz inmates include “Doc” Barker, Alvin “Creepy” Karpis, George “Machine Gun” Kelly and Floyd Hamilton. Madelyn Thomas, a native of Tulsa, Okla., traveled to San Francisco for Thanksgiving and was particularly interested in visiting Alcatraz with her family. “My dad is a history buff, so naturally, he was drawn to visiting Alcatraz while we spend some time here with our family,” Thomas said, while standing in front of the solitary confinement cells in the D Block section of the prison. “What shocked me was the story of an inmate who would remove a button from his uniform and toss it around blindly while in his solitary confinement cell trying to find it,” said Thomas. “And then would try to find it in order to do it all over again, just to keep himself from going crazy. Just the thought makes me feel a little crazy!” she added. The inmate Thomas was referring to was Jim Quillen, who was placed in solitary confinement for up to three months at a time. The recreational yard in Alcatraz. Inmates who behaved were given the privilege to go outside, feel the sun and exercise. In its history as a federal penitentiary Alcatraz recorded a total 14 escape attempts, in which the first recorded case was in April 1936 and the last was Dec. 1962. 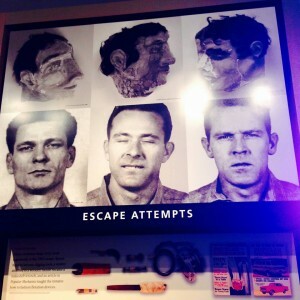 The most famous occurred on the night of June 11, 1962, when Frank Morris, Allen West and brothers Clarence and John Anglin concocted an intricate escape plan in 1960, shortly after their respective arrivals to Alcatraz, which took two years’ worth of work stealing tools and material. The famous 1963 Alcatraz escapees Frank Morris (left), and brothers Clarence and John Anglin (middle and right). They made their dummy heads to fool prison guards on the night of their escape. On the night of their escape, West was unable to remove the ventilator grill from his cell, and was left behind. However, Morris and the Anglin brothers managed to escape Alcatraz, and were never seen again. “Those guys made those dummy heads – they gathered hair from the barber shop to make it look realistic and put them in their bunks at night,” said Murphy. “They stole spoons from the dining hall, dug out through the rear of their cells, went up the air shaft, across the roof, and went down to try to get to Angel Island, which is about a mile and a quarter away,” he added, pointing to the island that lay quite some distance away from the prison’s location. Morris and the Anglin brothers climbed down a cast-iron stovepipe, and entered the Bay’s chilly, turbulent waters with flotation devices made from raincoats. They were never seen again, and it was presumed they drowned in their flee from Alcatraz. “Clint Eastwood made a movie in 1979 called ‘Escape from Alcatraz,’ which tells the story of that famous escape,” said Murphy. Frank Lee Morris had a long criminal history prior to Alcatraz, stemming as early as 13 years of age, his crimes ranging from drug possession to armed robbery. In one of his arrests, Morris was sent to the Atlanta Penitentiary, where he first met West and the Anglin brothers. Morris was sent to Alcatraz in Jan. 3, 1960, and his inmate number was AZ1441. Allan Clayton West was sent to Alcatraz in 1957, identified as inmate AZ1335. The only conspirator who did not escape that night, he gave statements and vital information on the escape plan to officials and was never charged with an escape attempt. John and Clarence Anglin were bank robbers that wound up in Alcatraz after attempting to escape from the Atlanta Penitentiary. John Anglin, inmate AZ1476, arrived in October 1960, while Clarence Anglin, inmate AZ1485, arrived in January 1961. While authorities claim Morris and the Anglin brothers never made it to Angel Island, over the span of several years, there have been claims of sighting the escapees. However, there is no solid evidence supporting they are dead or alive. “They never found their bodies. They don’t know if they made it; it’s a real mystery,” Murphy added. Family package: two adults and two children (ages 5-11) early bird and day tour: $90.25. No family package for the night tour, and family package can only be purchased by phone or at the ticket booth. Departure times: early bird – 8:45 a.m. day tour – 9:10 a.m., 9:30 a.m., 10 a.m., 10:30 a.m., 11 a.m., 11:30 a.m., 12 p.m., 12:30 p.m., and 1:05 p.m. Night tour –3:20 p.m. and 3:50 p.m.
Return times: Allow 15 minutes to return to Pier 33 after departure from Alcatraz, or 25 minutes from Angel Island. Early bird and day tour return times: 9:30 a.m., 9:50 a.m., 10:25 a.m., 10:55 a.m., 11:25 a.m., 11:55 a.m., 12:25 p.m., 12:55 p.m., 1:30 p.m., 2 p.m., 2:45 p.m., 3:05 p.m., 3:45 p.m., 4:25 p.m. Night tour return times: 6:40 p.m. Ferry terminal address: Pier 33, Alcatraz Landing, San Francisco, Calif., 94111. Alcatraz is open every day except Christmas, Thanksgiving and New Year’s Day. Alcatraz frequently sells out in advance, as much as a week or more in summer and during holiday periods. Plan your visit weeks in advance. 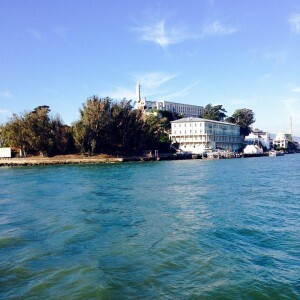 For more information on Alcatraz, visit: http://www.nps.gov/alca/index.htm.